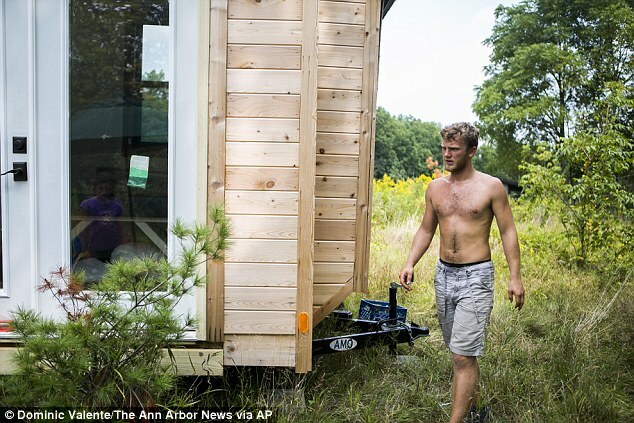 A student who’s had enough of paying out $800 a month to live in a campus dorm solved his problem by building his own tiny house from scratch. Christopher Cerk, a 21-year-old junior at the University of Michigan, said that living right next to his institution didn’t suit him – and was a waste of money to boot. So, rather than keep paying out almost $10,000 a year on rent for a room he didn’t want, the computer science major took matters into his own hands. 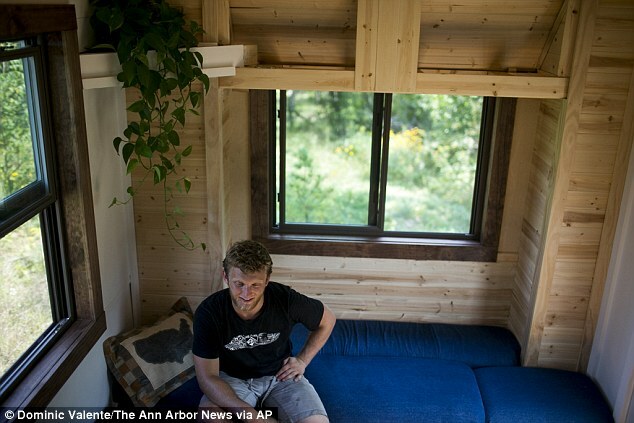 Great outdoors: Christopher Cerk has ditched his rented dorm room in Ann Arbor, Michigan, for this 170sq ft ‘tiny house’ that he built himself. 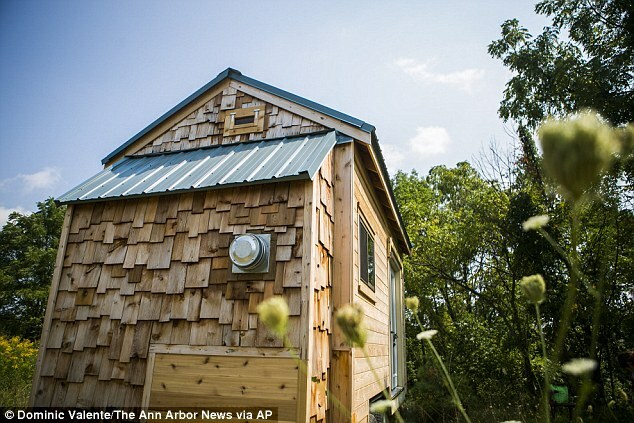 Cerk spent $13,000 of his own money buying materials for his own diminutive dwelling, which measures just 170 square feet, the Ann Arbor News reported. The home, which took him more than a year to build in his spare time, has a compost toilet and solar panels for electricity. He estimates the power supply will be enough to keep his cell phone and laptop running, as well as to power an electric stove. Cerk said he will start having his girlfriend over to stay soon. He said he had no handiwork skills before he started and learned everything he needed from YouTube tutorials. According to Cerk, he would have paid $19,000 over the next two years to rent a room near the university’s North Campus in Ann Arbor. 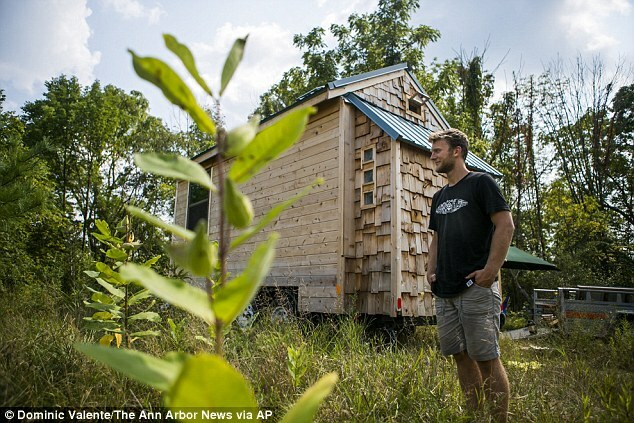 By building the house instead, he says he can save $6,000 – and will still have the house afterwards to tow someplace else. Cerk has now started living in the house, which he hauled from his family’s home in Traverse City and has parked up on a lot belonging to a local landowner, who will provide him with water and some other amenities. He has kept the exact location of the lot secret because of ambiguous local housing laws – which could see his tiny dwelling land him the wrong side of the authorities. Cerk said he is confident he will be able to live happily in the house – though has expressed some concerns about dealing with the winter cold and summer heat. He has a propane heater for the winter, but admitted that in the hottest months his best solution is to spend most of his time in air-conditioned buildings on campus. Efforts elsewhere to build smaller houses are gaining interest but are pitted against local size rules. Supporters say the mini-homes are cheaper to build and less costly to maintain. But detractors say they can be fire hazards and may reduce the value of nearby homes and property. However, tiny-house initiatives to help the homeless have sprouted up in places like Eugene, Oregon; Olympia, Washington; Austin, Texas; Madison, Wisconsin; and Huntsville, Alabama.